Bethany Homecrafts Upcycled Designs: A Busy Week! I've had an unexpectedly busy week. Now that I'm in market season, my weekly rhythm has changed. My schedule is such that in one week I have a market on Sunday, Monday, Thursday and Friday. That's supposed to be my busy week. The next week I have only one market, on Friday. That's supposed to be my relaxed week. Sigh and smile! I found that this week (the relaxed one) I ran around catching up on all the stuff I didn't get done last week, plus making stuff to keep my inventory up. It's been fun, but not what I expected! So this week I've done a bunch of maintenance for my booth - making new signs, stuff like that; and updated a bunch of hats from last year; made a flock of hummingbirds; cut and sewed a bouquet of flowers and did some embellishment on some things. Today I will have my Friday market in New Hartford if the weather cooperates, and Sunday will be my first day at the Coventry Farmer's Market. I'm looking forward to that! Nice to read that you are a happy, busy and smiling Lady. You have not have time to look at your birds ? 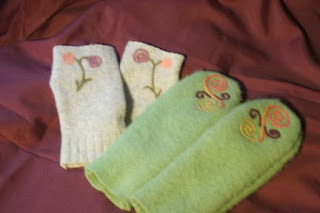 You have made some nice wrist warmers and flowers. 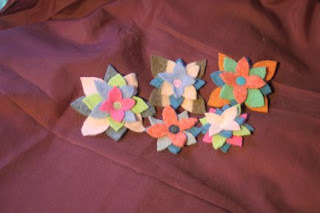 Good idea, the reclycled flowers!! Have a nice weekend!